It may seem harmless, but this four-letter word is actually doing a lot of damage. Take a moment to imagine yourself in the lowest mental state you could possibly be. Removing yourself from your bedsheets to move your body feels about as excruciating as climbing Mount Everest barefoot. Or maybe out of nowhere your heart starts thumping so fast that your breath hitches in your throat and your lungs can’t get air. That four-letter word may seem harmless, but it actually can do a lot of damage. “Just” implies that whatever task or behavior ― say, exercising or relaxing ― you’re suggesting is easy or uncomplicated. In reality, it’s anything but, according to experts. 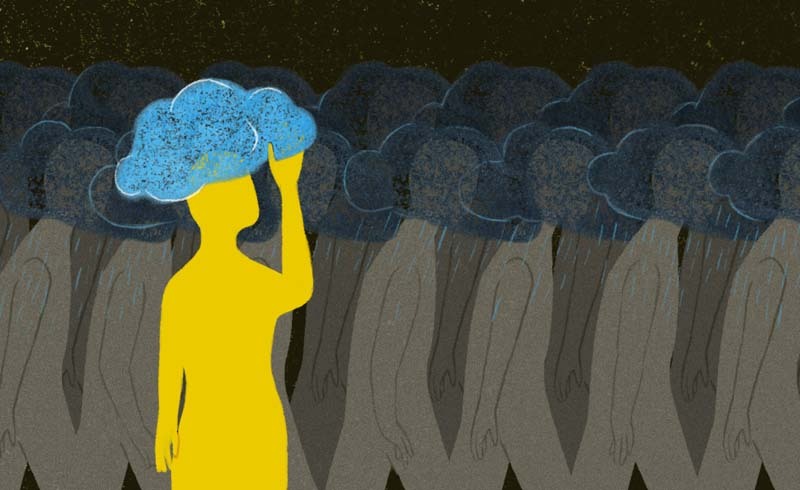 “For many people with anxiety and depressive disorders, everyday tasks that seem ‘simple’ to others can be very challenging,” said Elizabeth Duval, an anxiety expert and assistant professor of psychiatry at the University of Michigan. While focusing on one tiny word may seem like nitpicking, the fact is that the phrases you use carry more weight than you might realize. This is especially true when it comes to mental health, where flippant conversations or casual terms can easily contribute to stigma. Expressing your concern is always a great initial step. It doesn’t have to be this exact phrasing, but try saying something that acknowledges how tough it can be to do certain tasks when you’re living with anxiety or depression. “You need to start out slowly in addressing the things that are challenging and move along at a pace that is manageable,” Schwartz said. So, instead of asking, “Why don’t you just try exercising?” try suggesting that they go on a walk with you for a few minutes. Just make sure you’re involved. “Offer to engage in positive and enjoyable activities with them ― invite them to go for a hike, go to the gym or watch a movie with you,” Duval said. Whatever you do, try not to offer unsolicited guidance ― at least not without checking with your loved one first about what’s useful to them, said Amy Alexander, a psychiatrist at Stanford Health Care. Asking what you can do to help someone is always a great way to show a loved one you support them, Schwartz said. Get specific. Tell your best friend that you love her dry sense of humor. Tell your brother you appreciate how he shows up for your parents. This is worth repeating: There is absolutely nothing wrong or bad about getting help from a mental health professional. And it’s important to make that clear to someone, both as a way to alert them of their options but also to erase some of the stigma that comes with seeking support. “If someone with a mental health condition asks for help, offering to assist them with identifying or accessing treatment or other resources could be helpful,” Duval said. The Anxiety and Depression Association of America, The American Psychological Association and the National Alliance on Mental Illness are all great places to start, she added. Above all, it’s important to keep in mind how tough mental health conditions are when you’re interacting with a loved one who’s experiencing one. When you have depression, getting out of bed and working out seems insurmountable. When you’re in the throes of anxiety, calming your mind and slowing heart rate on the spot seems impossible. You either feel like you’re going to die or you feel absolutely nothing at all. Both are debilitating to the point where “just” doing a task isn’t difficult ― it’s often completely out of reach.